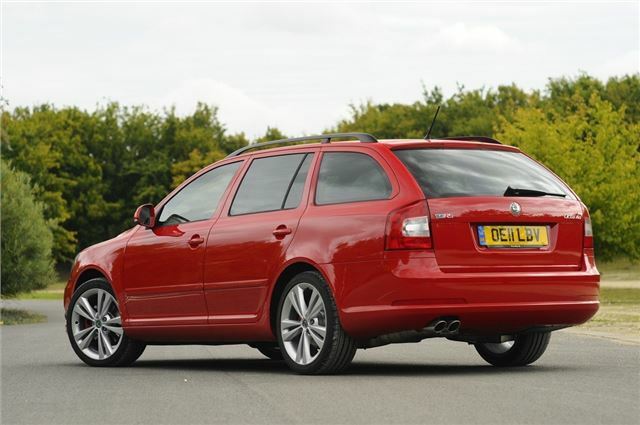 The second generation Octavia vRS came along in 2005 and like the original model was available as a hatchback and an estate, meaning you could have a practical family car with hot hatch performance. The big news was the increase in power with the second generation Octavia getting the same 2.0-litre TSI engine (originally referred to as TFSI but changed for Skoda, SEAT and Volkswagen to make things simpler) as the Golf GTI and the same 200PS. The turbocharged engine is a wonderful unit to exploit and with a 0-62mph time of 7.3 seconds, this is one swift Octavia. The engine revs freely and is happy to be pushed up to the red line while the six-speed manual gearbox has a short and sporty shift. It handles well too, striking a great balance between a comfortable ride and sharp handling meaning it’s a great all rounder – fun and enjoyable when you want it to be but still practical and comfortable enough when you have the kids in the back. Skoda also did well with the styling. Okay, so this is an estate and is never going to look stunning but it retains the understated look of the original Octavia and Fabia vRS models and thankfully hasn’t gone over the top like Vauxhall did with the Astra VXR. When the Octavia was facelifted in 2009, the vRS version also got the new styling (although it was a few months behind the standard model) with a smoother look and a similar front end to the second generation Fabia. It still looks good but we remain fans of the pre-facelift model with its clean and unfussy lines. Performance estate cars aren’t that common. After all – most people who go for power and pace aren’t too worried about practicality – but there are some about at this level. There's the similar age Ford Mondeo ST which came as an estate (and was a favourite with the boys in blue) and the Vauxhall Insignia VXR Sports Tourer, but while it’s far more powerful, it’s also far more thirsty. That leaves the Octavia Estate vRS in a unique position as the only truly affordable performance estate car at this level. This Octavia vRS may be getting on in years, but it still has plenty going for it and remains as great to drive as it ever was – even as an estate.